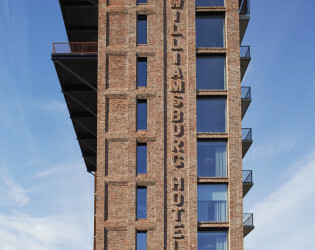 The Williamsburg Hotel is the center of Brooklyn social events. 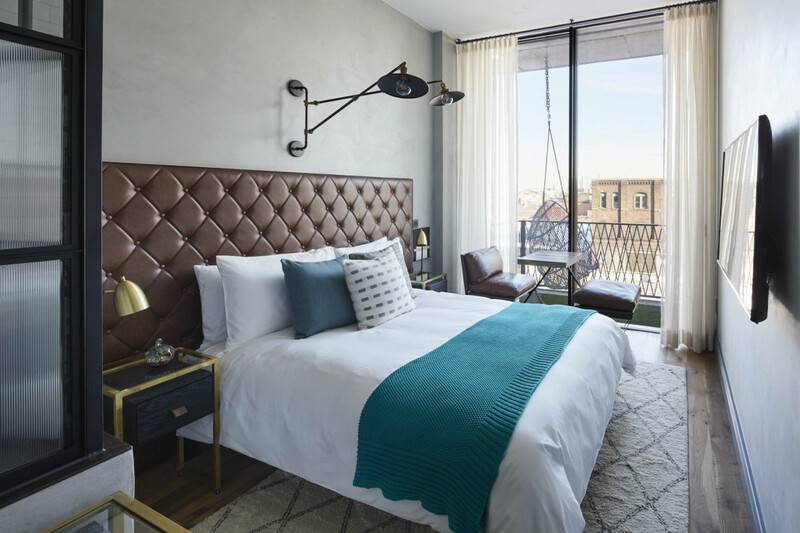 Located at the prime corner of Wythe Ave and North 10th St. in Williamsburg Brooklyn, this eight-story, 147-room brand new Hotel strikes the perfect pitch between spectacular service and style. 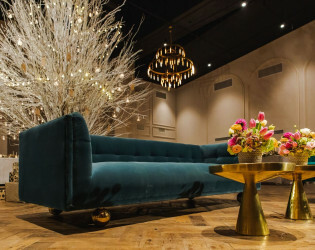 The Williamsburg Hotel is the center of Brooklyn social events, engagement parties, weddings, birthday parties, press launches, and corporate events. 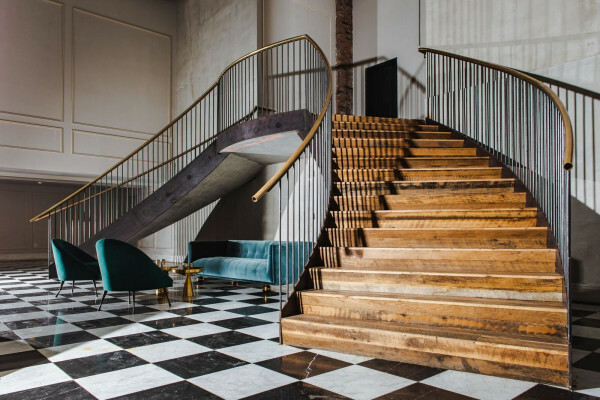 The goal is to create the most attractive event spaces in Brooklyn. There are five event spaces including a 6,500 square foot main ballroom. 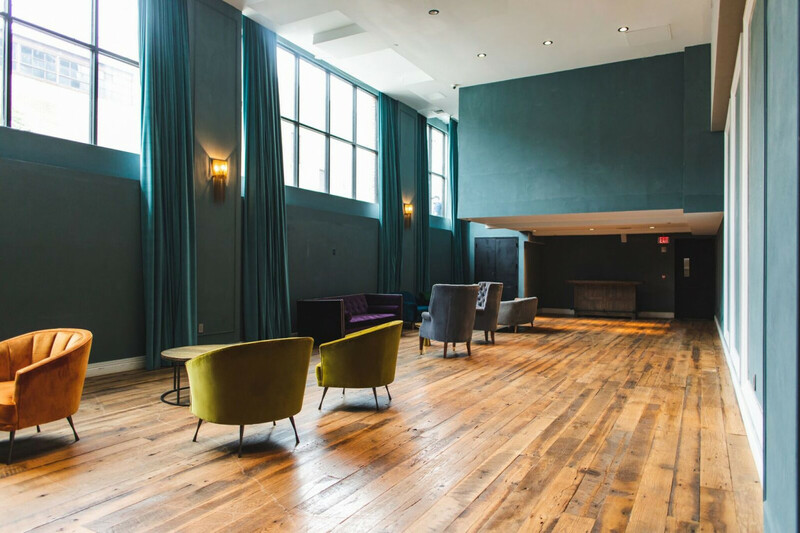 These spaces range in size providing an event venue for every type and size of event. 147 Rooms and 5 Skyline Suites with cityscape views along with 3 junior suites. Keep your eyes out for Bill Harvey - the man, the myth, the legend that our restaurant Harvey is named after. He’s a regular in the hotel. You might be a meat eater, but our vegan pizza will give you a run for your money! The Cavalo Nero Pizza on our bar menu is a fan favorite. Smile and say cheese! Our Chef takes his cheese selection very seriously. Ask for a sample and get ready to taste the best cheese of your life. Our reception team is from all over the world! Start chatting with them and hear an interesting story or two. In the warmer months, enjoy a brew in our own curated Biergarten located along Wythe Ave.
Hey don’t leave your furry friends at home! We’re pet friendly and love when man’s best friend comes to visit. 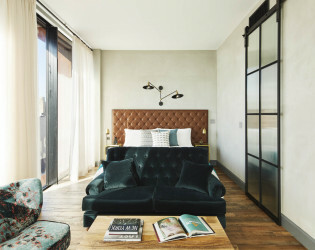 Sleep with a Local - that’s our tagline. We are partners with just about every local spot, so if you want to explore the neighborhood let us know! We might be able to hook you up. The best way to get around is biking around. We have a handful of bikes for our guests to ride around the hood! 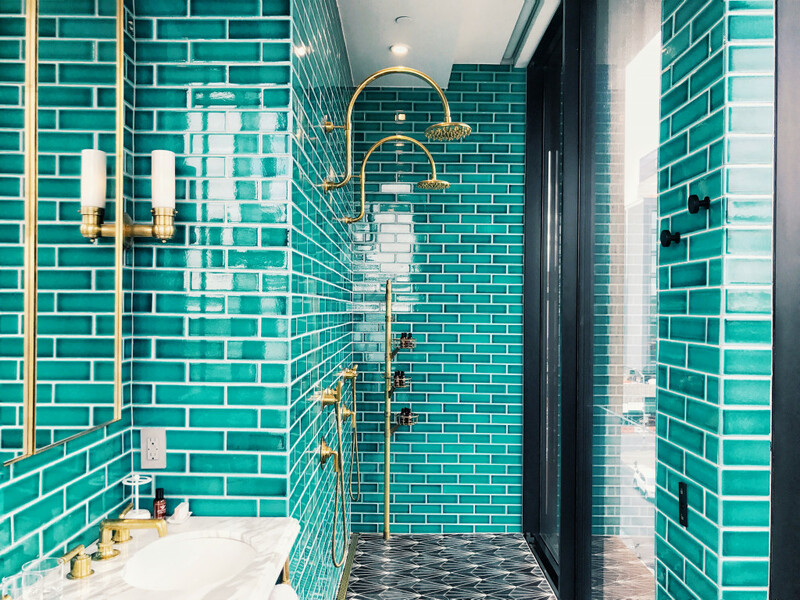 Call down to reception and you’ll be on your way. 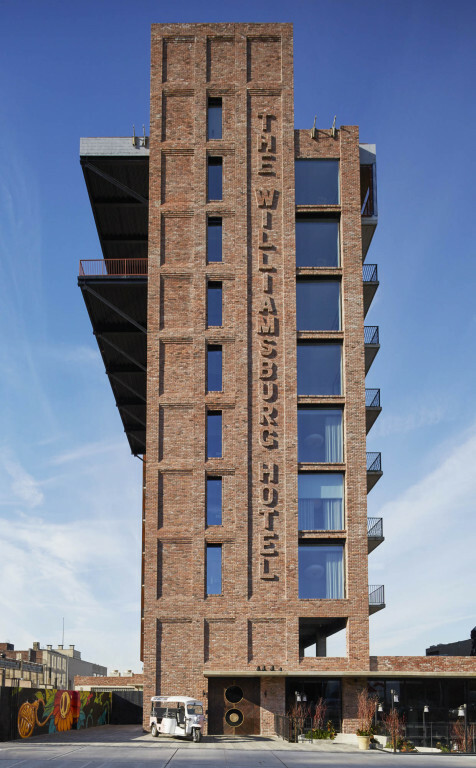 Wake up on the right side of the river and order a latte. Better yet, ask for Hadley - our AM breakfast server who does the best latte art around. 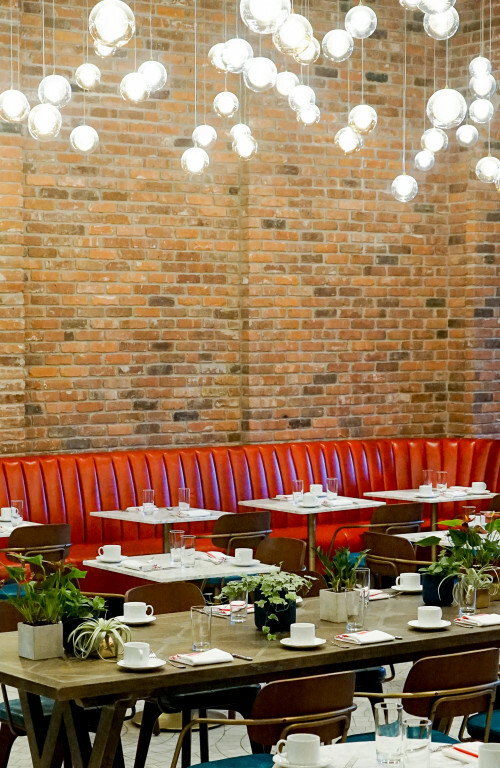 The Williamsburg Breakfast is our signature - get the works with this meal and enjoy a signature dish. 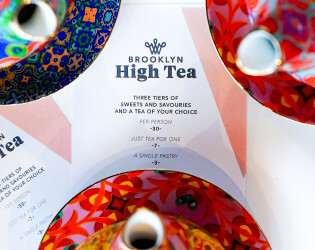 Brooklyn High Tea is all the rage right now. 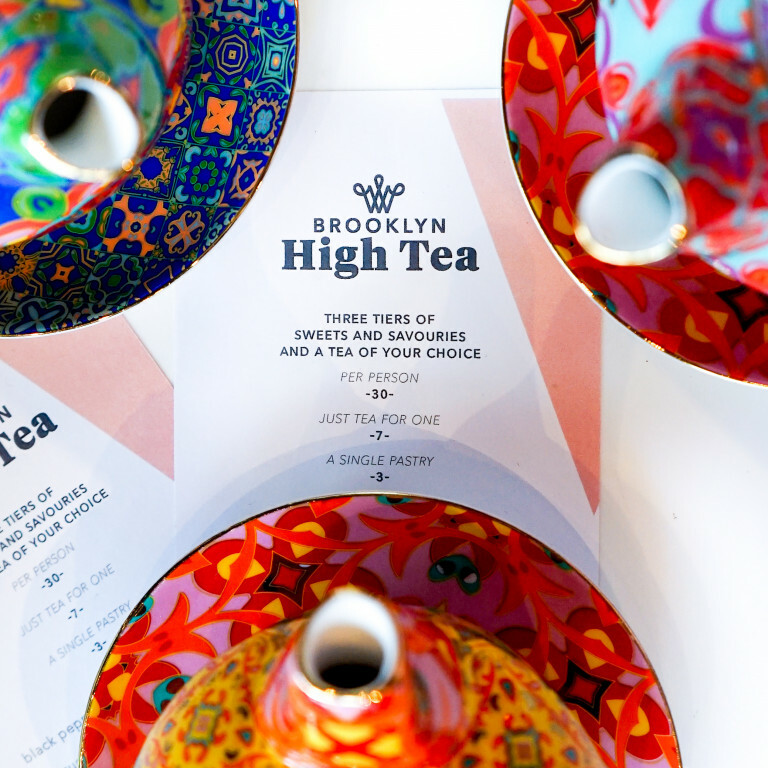 Friday through Sunday join us for our unique twist on traditional high tea offering a high selection of tea and treats made from our very own Brooklyn Bread Lab. Bushwick isn’t too far! 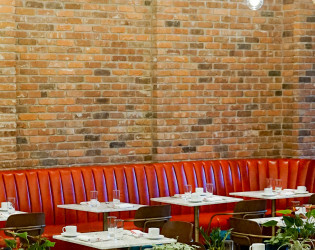 Ask our marketing team for a tour of the Brooklyn Bread Lab, our bakery outpost located 15 minutes away. We mill our own fresh flour and create endless treats with it that are served at the hotel daily. 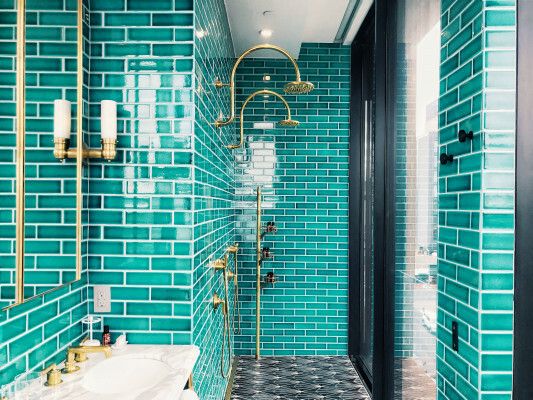 Located at the prime corner of Wythe Ave and North 10th St. in Williamsburg Brooklyn, this hotel strikes the perfect pitch between spectacular service and style. 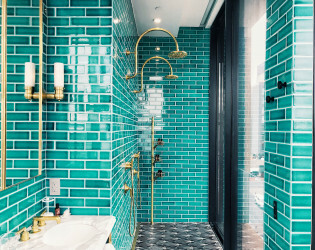 The guest rooms are richly tiled-and-textured with authentic reclaimed materials, and the lobby bar and lounge area have a very classy-cozy feel. 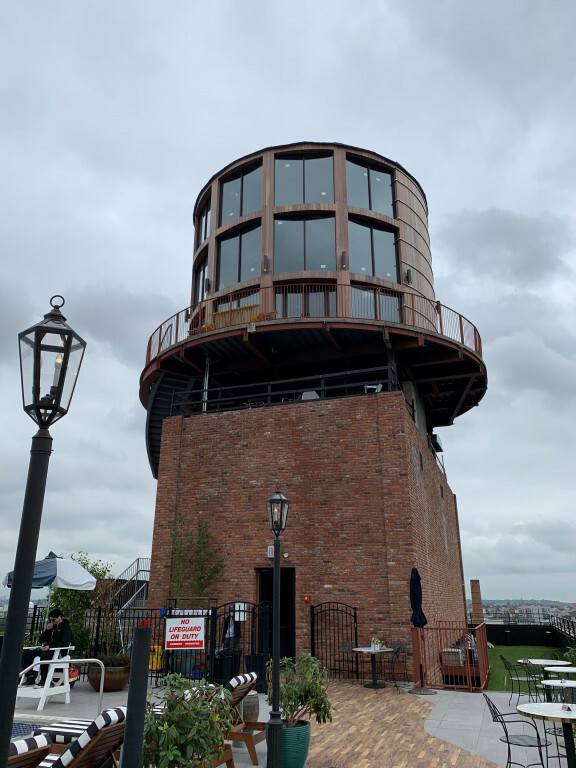 the newly opened Roof Top Pool and Water Tower Bar. The Williamsburg Hotel is elegantly dressed with double-height ceilings, natural finishes and eclectic interior furnishings that celebrate the multicultural population of Brooklyn's thriving Williamsburg district. 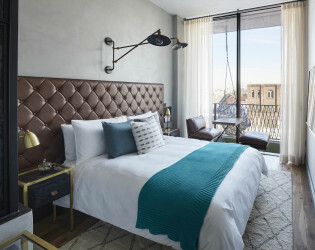 The Williamsburg Hotel offers hyperlocal amenities from a propertybranded "tuk-tuk" that gives lifts to its guests across the neighborhood, a partnership with local bakery Brooklyn Bread Lab, complimentary bicycle rentals and dog-friendly amenities and perks for canine-loving guests. 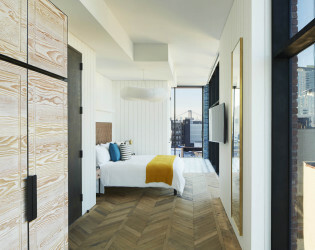 In a nod to its Brooklyn heritage, The Williamsburg Hotel features exclusive wallpaper created by Beastie Boy Mike D, depicting "quintessential Brooklyn scenes and figures" in the lobby area, and an art installation of thousands of strands of multi-colored yarn as crowns to the lobby bar created by street artist Eric Rieger. 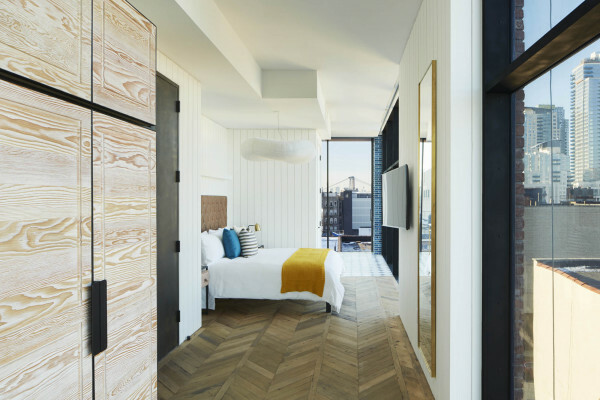 Guest rooms feature floor-to-ceiling sliding glass acoustic windows with Manhattan, Brooklyn and East River views, and design schemes vary from white-washed timber walls to deep grey distressed finishes with bespoke leather, brass, marble, and textured details at every turn. Rooms are thoughtfully designed with elements like a sitting table doubling as a tray for room service, open-windowed showers to create a loft-like space. Upgrades available to a room with a terrace with amazing views. 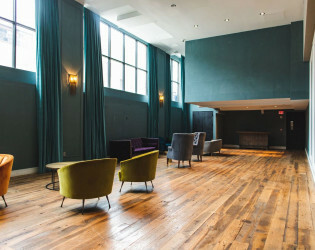 Located in a subterranean space – the Library Bar at The Williamsburg Hotel comfortably seats 80 ppl in a lounge setting. 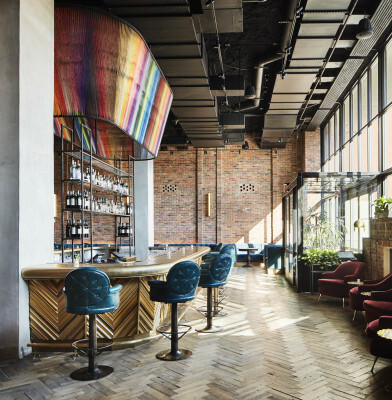 With a speakeasy vibe and extensive collection of vintage books – this space turns into one of our nightlife destination spots after 8pm with a full bar for late-night cocktails and light bites along with the sounds of our resident DJ. 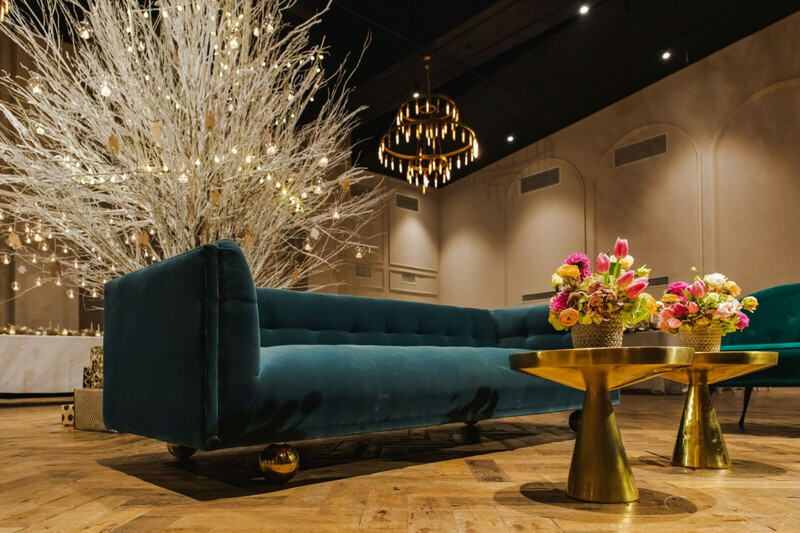 Located on our lobby floor - between our restaurant, Harvey and the Lobby Bar we can host up to 300 guests with plenty of options for reservations and flexibility to accommodate an array of events and needs. The highest hotel rooftop bar will be equipped with a cafe, pool and cabana area to assure that the guest has the most impeccable experience. 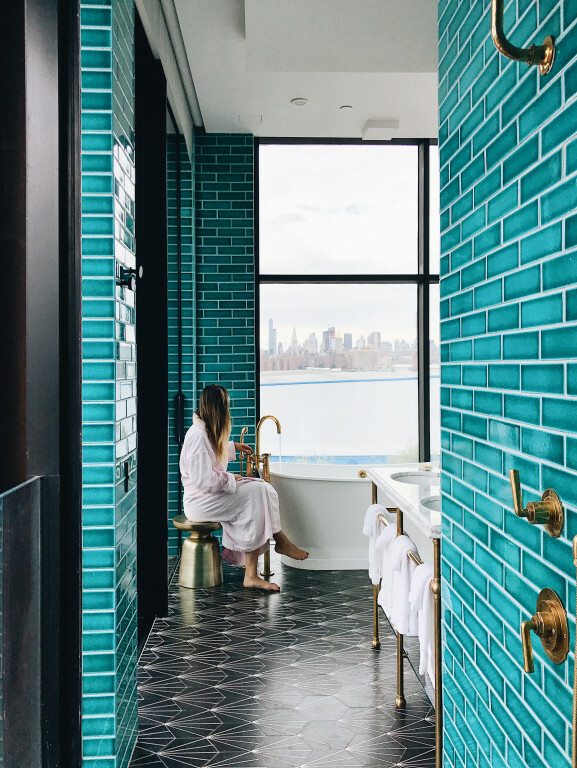 While looking over the Manhattan skyline and all of Brooklyn with views of the Williamsburg bridge, our VIP guests will retreat to this space. Brides alike will swoon over this masterpiece as well as our corporate accounts in the peak of summer. An exclusive 55 person bar, this space will be the most anticipated and highly marketed. 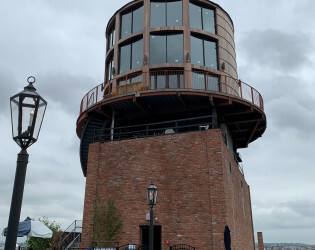 Available for our VIP guests and reservations, the Watertower bar will offer guests a true uniquely experience with a push cart of beverages and light bites looking over the entirety of Brooklyn and skyline of Manhattan. 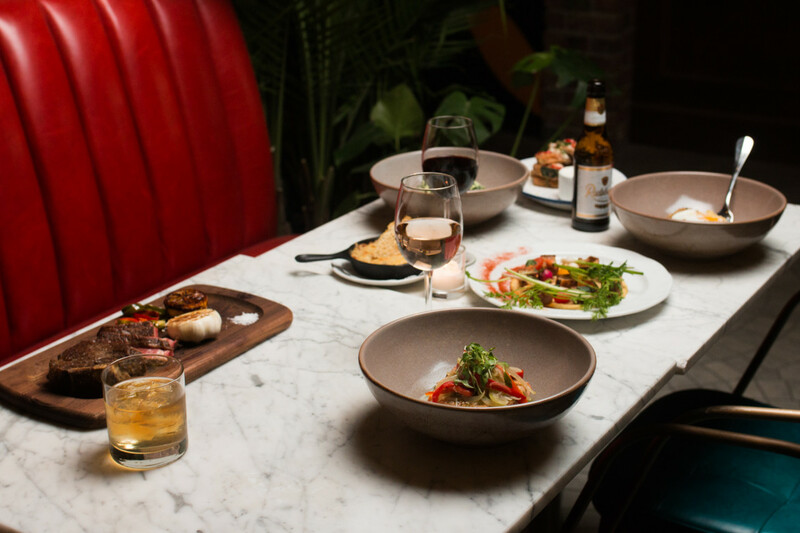 Located in The Williamsburg Hotel in prime North Brooklyn territory, Harvey is a stylish 105-seat New American bistro with a focus on pure, healthful foods and artisan breads baked in-house in collaboration with Brooklyn Bread Lab. 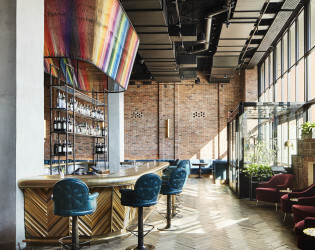 Under the guidance of Chef Kevin Chun, the restaurant’s vegetable-forward menu emphasizes fresh, inventive seasonal fare with a focus on whole grains freshly milled in-house as well as local meat, ﬁsh and produce. The restaurant is open daily for breakfast and dinner and also offers a special high tea service on weekend afternoons as well as nightly live music. 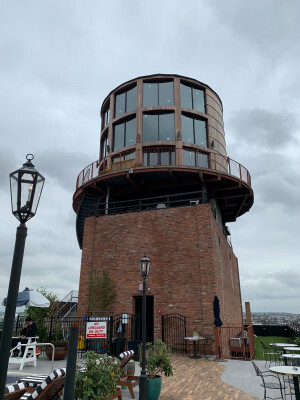 It strives to support its fellow Brooklyn vendors whenever it can and features local purveyors on each of its menus, from Five Acre Farm to Salvatore Brooklyn Ricotta. 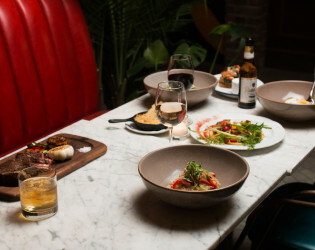 Harvey’s casual elegance, ingredient-driven culinary style, and sincere appreciation for the beneﬁts of eating and drinking clean, natural food and wine mean there is something on the menu for everyone, from the local Brooklynite hoping to impress a date with a ﬂawless evening out and the health-conscious New Yorker on the hunt for a nourishing meal to the ten-year-old on vacation with her food-loving parents. 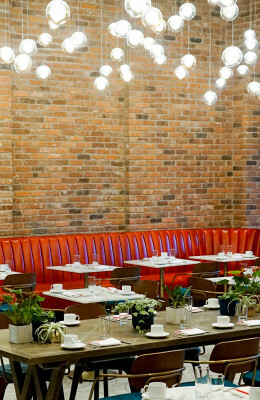 Harvey’s polished interiors reﬂect a thoughtfully modern aesthetic while its ambiance exudes the warmth and candor of a classic diner, encouraging guests to sink into the sleek red booths lining the restaurant’s perimeter or engage with one another over a shared meal at the inviting communal tables in the center of the space. The restaurant is located in The Williamsburg Hotel, an eight-story boutique hotel encased in brick, glass, and Corten steel. 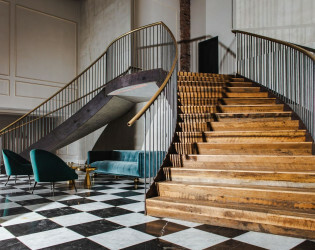 Designed by London-based design ﬁrm Michaelis Boyd Studio (Babington House UK, Soho House Berlin), the hotel’s eclectic style, natural ﬁnishes, and colorful accents invite guests to while away a morning in its light-drenched lobby or an evening at its soaring upstairs bar, where a vibrant yarn-based art installation by Eric Rieger stops visitors in their tracks. You can't miss sipping on one of our staff favorites, the Perfect Harvey cocktail in our lobby bar named after our restaurant and the mogul Bill Harvey himself.